*The R-0870 (DPD) Powder Jar contains a full 10 grams. The jar is intentionally oversized to prevent spilling when you scoop powder from the jar. 1. The Speedstir- I thought this little device was somewhat frivolous until I got one for my kit and started using it....Wow! It really makes the tests more accurate and precise. 2. 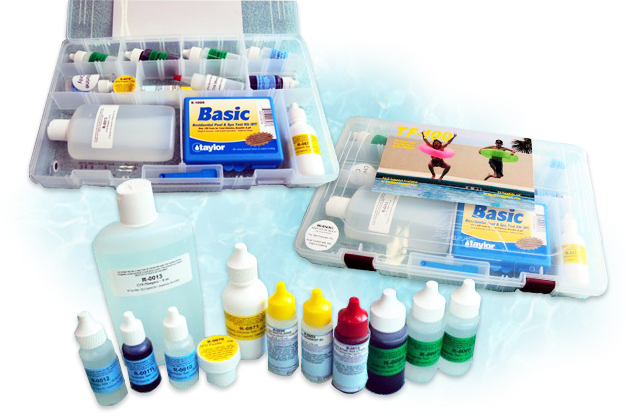 Borates Test Strips - If you use borates in your pool, or plan to, these strips will provide you adequate accuracy to keep your borates around the 50ppm recommended mark. 3. AquaChek Salt Test Strips - If you have a salt pool, testing the salt content of your pool water is very important. 5. The "XL" option - This doubles the volume of the two most expensive reagents. It is a really good way for people with green pools (algae) or performing baquacil conversion to get the extra testing materials they need and save some money doing so. 6. I have been using my pH meter for two years now and use it more often to test pH than I use the drop test for pH. I can't discern between the colors on the pH comparator block, so the meter gives me a quick, accurate reading without any fuss. It does need to be calibrated (about every 5 months), but it comes with buffer solutions OR you can use the pH standard to calibrate it. It is easy to calibrate it. I highly recommend using it in conjunction with phenol red pH test. 7. The "Standard Sampler"-Did you ever want to have the answers to the test? Now, you do! Standard Solutions are basically pool water with a set level. 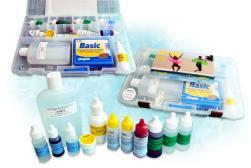 Standard solutions provide an excellent way to test your reagent and/or your testing methods. You simply use the Standard solution like it is pool water and perform the test. Each test is designed to help you understand the condition of your pool water. Combined, these tests give you a perfect "picture" of your water. The results will let you know, even if your pool is perfectly clear, that you may need to make some adjustments to keep it that way. Chlorine Test (OTO) - Very dependable for detecting the presence of chlorine in your pool - normally used daily. The most common cause of pool water problems is lack of chlorine. pH Test - This important parameter of your pool water should be tested frequently. Too high and you can form calcium deposits (scaling). Too low and you can damage your equipment. Chlorine Test (FAS/DPD) - This test separates the TF-100 from cheaper "bargain" kits that simply do not have this test. Measuring chlorine VERY precisely, even up to 50ppm+, this test is indispensable to a pool owner, especially when correcting pool water problems. Combined Chloramines Test - CC's are a good indicator of the need to shock your pool. The TF-100 can measure CC's down to .2ppm. Cheaper kits will not have the CC's test. Calcium Hardness Test - Measure the CH of your pool water and your fill water as well. This allows you to control and manage this important parameter. Excessive calcium contributes to scaling and too little can damage your plaster. Total Alkalinity Test - TA buffers your pH. While there is a lot of latitude with this parameter, close monitoring (testing) several times during the summer is essential. All packed carefully in a customizable, large plastic case, these kits come complete with all the chemistry and hardware you need. Thorough laminated instructions will guide you step by step through each test and provide you with guidelines to tell you what levels are acceptable. If you would like even more detailed information on the tests, just click on the test kit instructions under "More Info" above and on the left of the screen.